Engineered Septic & Sewer was founded more than ten years ago to provide residents and businesses in Middlesex and surrounding Connecticut counties with Septic & Sewer Services such as Tank Pumping, Sewer Connections and Site Work services that are a step above the expected. The company operates on one simple but powerful principle: we will be successful if we provide superior sewer & septic services to our customers. This principle starts at the top: company founder David Acheychek brings a mix of science and practical knowledge to every project his firm undertakes. A mind like an engineer – and an engineering degree! With a Bachelor of Science in Civil Engineering and two decades of hands-on experience septic installation, sewer and city water connections and general site work, David understands the theory of how septic and sewer systems operate and the practical nature of making them work well. With this education, background, and experience, David and his company, Engineered Septic & Sewer, represent a septic and sewer contractor capable not only of completing your project right the first time but also making sure it meshes well with your existing infrastructure. This combination allows us to save you time and money. Not just Septic and Sewer! While we specialize in septic and sewer work, Engineered Septic & Sewer also provides a full array of site work services. We have the experience and equipment necessary to perform a variety of construction projects such as retaining walls, construction excavation, grading and land clearing. We offer our clients different pricing structures to meet different project needs. When a client has design plans for a project, we estimate the project and submit a bid accordingly. When a definitive design is not in place we offer time, material and negotiated contracts. Our clients include cities, towns, institutions, schools, property management companies, homeowners, and more. At Engineered Septic & Sewer we are more than happy to answer any questions you may have regarding the services we provide or any questions specific to your project. Please feel free to email or contact our office 1 (860) 767-0603 for a consultation. ESS owner David Acheychek and long-time employee John take a break from the Excavating Action. 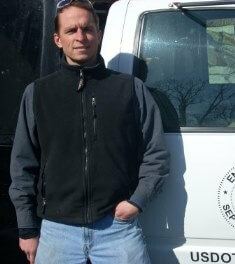 As a licensed engineer, ESS owner David Acheychek works well with Town and County Engineering Departments.